Because it was asked: A "humming noise" has a low frequency, a "screaming noise" a high frequency. Try it out. In case of questions or obscurities regarding the current PiA-task, we publish hints and advices here. Hence, it’s worth it to read the “Advice of the day” before giving your answer. If there are still questions left, you are welcome to contact us. 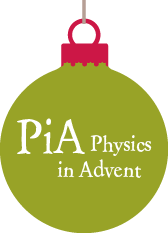 You can download the current shopping list for PiA - Physics in Advent 2018 here. Posters and flyers can be ordered free of charge here.